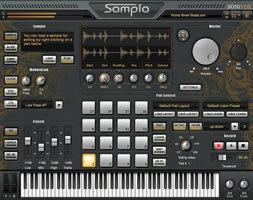 Sampla - Hip Hop Production Sampler, Sampler Format Converter/Browser from SONiVOX MI. SONiVOX has announced the availability of Sampla - Hip Hop Production Sampler, a new virtual sampler plug-in for Mac OS X and Windows, in stand-alone and VST, AU and RTAS plug-in formats, designed for beat creation for hip hop producers. MPC style editing & slicing for easy instrument & beat creation. Imports Wav, Acid, Broadcast Wav, Aiff, & MP3 Format Files. Easy to use record functionality for real time sampling. Over 250 factory preset instruments and pad layouts. Tempo Sync Stereo Delay, EQ, and Chorus Effects. Assignable filter section with 10 filter types. Graphic waveform display with zoom, click, and drag functionality. MIDI Learn & Save functionality, Sampla is instantly compatible with any MIDI keyboard or pad control. Pad-Specific Variable Resolution Note Repeat and Pattern Arpeggiation Mode. 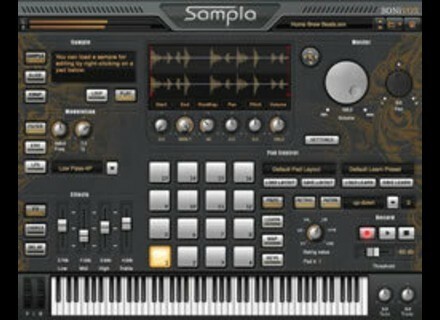 Sampla - Hip Hop Production Sampler is a part of SONiVOX's Hip Hop production line of products that also includes Playa: Hip Hop Virtual Instrument, and Playa: Aggro Electro Boom. Sampla is available now with a MSRP of $149 and an introductory street price of $99. 9 Soundware Ring RingShifter Presetsdelete Ring by 9 Soundware is a collection of presets for the RingShifter ring modulator/frequency shifter within Apple Logic Pro. Tasmodia Zebra Playground Tasmodia has announced the release of Zebra Playground, a new soundset for the Zebra2 synthesizer from u-he. Wavemachine Labs iGOG for iPhone iGOG is a drum machine app with velocity sensitive pads.